Vision Mart in Farmington provides friendly services from the front desk to the exam room to phone calls to let you know your glasses or contacts are ready. We strive to answer any questions you have and will get you in and out within an hour. 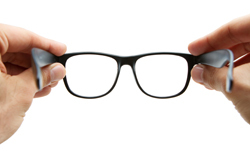 If you’ve lost your glasses or ripped your last pair of contacts, we will get you in as a same day walk-in. We may have sample pairs of contacts available that are close to your prescription or temporary glasses for you. You’ll see décor such as mountain goats and other taxidermy on the walls, along with photos, adding a personalized touch to the waiting room. We have some of the most affordable prices in the area. Our practice is locally owned and operated by Dr. Bo Herrera and have 2 experienced optometrists on staff. Our staff is bilingual, allowing us to serve the Spanish speaking community. Habla Espanol. We’re also open on Saturdays until 2pm so you can get in to see us around your work schedule.